Apple Working on Mac Tablet in Addition to 10" iPod? A new Apple Knowledge Base article says that with Snow Leopard you can share your music, printers, files, and even your screen with other computers on your network. In previous OS X versions, in order for items shared by your Mac to always be available, you had to configure your Mac to never go to sleep. However, with the new Wake on Demand feature in Mac OS X v10.6 "Snow Leopard" and an AirPort Base Station or Time Capsule, you can see and access shared items even if the host Mac is asleep, which helps save energy and reduce costs while still ensuring full access to all shared files and devices -å even remotely across the Internet. Note that this service requires an Apple AirPort Base Station or Time Capsule with firmware 7.4.2 or later installed. The Register Hardware's Tony Smith reports another twist in the Apple iTablet irumor saga: According to an unnamed "mole" cited by Gizmodo as having "always been 100 per cent reliable", in addition to a 10" scaled up iPod touch, Apple is also working on 13" and 15" models, both running Mac OS X and seen in a factory in Shenzuen, China. "Will the iTablet run iPhone OS or Mac OS?" Smith asks rhetorically. "Two types of device mean the answer could be both." Link: Apple Working on Mac Tablet in Addition to 10in iPod? ZD Net Asia "Mr. Tech" blogger Lee Lup Yuen says that as a registered Microsoft developer, he had early access to the final release version of Windows 7, which he installed on his 17" MacBook Pro. He notes that the 64-bit version of Windows 7 Ultimate installed smoothly using the the Boot Camp Assistant bundled with Mac OS X and has worked great for the past 3 weeks, getting about 3.5 hours of battery runtime. Mr. Lee notes that overall, 64-bit Windows 7 works very well on a MacBook Pro, boots quickly, feels very responsive, and seems to take full advantage of the fast solid state hard drive and the huge amount of installed RAM (8 GB) on his 'Book. "If security is an issue and you re afraid a thief might make off with your Mac, then maybe security through obscurity is a good idea. Stuff your MacBook into an old pizza box on your desk. That s secure. Or, hide it inside an old newspaper." A new Apple Knowledge Base article informs as to what you can do if you experience one or more of these issues with the hinges on your MacBook Air. Unable to close lid completely. Broken or cracked plastic near one or both of the hinges. More than one inch (2.54cm) of free play while opening or closing the lid. For resolution you can take your MacBook Air to an Apple-Authorized Service Provider or Apple Retail Store for evaluation and repair if necessary, even if your product is out of warranty. If you previously paid for a repair for hinge-related issues that were not caused by accidental damage, you may be eligible for a refund. Contact Apple for more information. A new Apple Knowledge Base article says that Mac OS X v10.6 Snow Leopard includes an improved Battery menu bar extra for portable Macs. The Battery menu bar extra provides information about the condition of the battery, as well the amount of time remaining on the current charge, the current active power source, and any current charge status details. If you see "Replace Soon" in the Battery menu, the battery may still be usable and hold some charge, however, you might consider battery replacement. If the "Replace Now" and "Check Battery" reports pop up and the battery in your 'Book is removable, the article suggests removing and reseating it. If the battery is not removable, it may be necessary to reset the System Management Controller (SMC). PR: gScreen Computer Corp. plans to launch its new Dual-Screen Spacebook 2009 Laptop computer, which will be the first dual screen laptop with two identical 15.4" screens and a full-size keyboard, built into one laptop unit in Q4 2009. A gScreen Spacebook 13.3" is projected to be released sometime after the 15.4" and will feature expandability to 24-inches of screen area from the nominal 13.3." A 17" model is being floated as a future possibility. Currently, the Spacebook's planned technical specs include two LED backlit display screens, and Intel Core 2 Duo P8400 2.26 GHz CPU, and Nvidia GeForce 9800M GT GPU with 512 MB dedicated memory or an Nvidia Quadro FX 1700M Graphics with 512 MB dedicated memory, 4 GB DDR2 SO-DIMM RAM in two modules, a 320 GB 7200-rpm HD, IEEE 1394 (FireWire Graphics Card Output (15-pin, D-Sub), HDMI support Mic-in, Line-in, and headphone jacks, a PCI Express Card slot, a 90 watt AC Power Adapter, and a Li-Ion 9 cell battery pack. And of course a version of the Windows OS, but gScreen says they will be anxious to test Google's new Chrome-based OS on their gScreen Spacebook to see how it performs in the dual-screen environment. Needless to say, the Spacebook will be no lightweight. A startup, gScreen Computer Corp., is an American owned technology company based in Anchorage, Alaska. Founded in 2003 by a small group of private investors that is focused primarily on the design, production, marketing and sales of dual-screen laptop computers. Founder and Chief Designer, Gordon Stewart started gScreen as an R&D company with a focus on developing dual-screen laptops for filmmakers, photographers, video and graphics designers and CAD engineers. The company says potential customers have shown tremendous interest in their product from the Banking, Accounting, Investment and Trading sector and the Department of Defense including the US Navy and Department of Homeland Security. 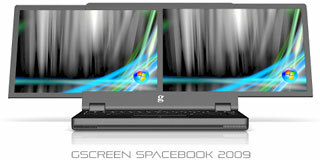 The gScreen Spacebook is slated to be sold through various retail outlets. including Amazon.com and the company will offer 100% North American Sales and Tech support for all gScreen laptop computers. The company is currently developing the gScreen Titan- exclusively for use by the US Navy at this time, but anticipates eventually making them available to the general public. The Titan M-1 dual screen workstation. This Duo 15.4 workstation is a ruggedized version of the proposed G400 dual-screen business and consumer laptop. The M-1 product is being built specifically to specs requested by the US Navy for extreme environments. This is nothing like the "WingBook" that we speculated about in 2002. PR: MyService has announced a new 750 GB upgrade for the MacBook Pro. These new Scorpio Blue drives by Western Digital are the largest mobile drives available. MyService has these drives in stock. The upgrade service includes the new drive, round trip shipping, professional installation and data transfer. MyService makes the service process fast and easy. MyService sends a custom laptop shipping container to you. All shipping is insured and can be tracked online. MyService has announced a new 750 upgrade for the MacBook Pro. These new Scorpio Blue drives by Western Digital are the largest mobile drives available. MyService has these drives in stock and the complete upgrade service is $375. The price includes the new 750 GB drive, round trip shipping, professional installation and data transfer. Your old hard drive is returned to you and can be used for backups. Since MyService is an Apple Authorized Service Provider, the 750 GB upgrade will not void your Apple warranty. These drives are slightly higher than standard 2.5" drives but fit perfectly in all Unibody MacBook Pros, the 13" MacBook Unibody and the 17" (Silver Keyboard) MacBook Pro. MyService makes the service process fast and easy. No phone trees, no run-around, just awesome service. MyService sends a custom laptop shipping container to you. Once it arrives, simply pack your laptop and send it back using the prepaid UPS shipping label. All shipping is insured and can be tracked online. You may drop your laptop at any one of the 4,200 UPS Store locations within the United States. Once your laptop is back at MyService, a certified technician installs the new drive and transfers the data over from your old drive. If your old hard drive is failing, a new operating system is installed. All drives feature a 3 year manufacturer warranty. After the service is completed, your laptop is cleaned, tested and sent back to you, along with your old drive. All services are completed within 24 hours of arrival. MyService accepts purchase orders from education facilities. For more information visit the MyService website or call 877-622-3473. PR: Toshiba's Portable Hard Drives make computer backup simple. Our drives take the complexity out of backing up your computer data by providing easy-to-use backup software for both Windows and Mac users. Powered by USB 2.0, you can take your files just about anywhere. Just one click and you're on your way to creating a digital safety net to help protect your files. Toshiba's next generation Portable Hard Drives feature complete system backup (Windows only), password protection for added security and enhanced software features. Plug in the drive, load the software and you'll have peace of mind in knowing that all of your important digital photos, music, movies and documents are backed up, protected and portable. The software runs in the background capturing updates to files and automatically saving them to the external drive. Toshiba's Portable External Hard Drives work with both Mac and PC computers and include software that makes backing up your computer simple. With everything you need right in the box, Toshiba's External Hard Drives are the ultimate combination of storage and style. Available in Liquid Blue, Komodo Green, Rocket Red & Vivid White. Some colors may not be available in all drive sizes. While most systems provide sufficient power over the USB port for the Toshiba Portable External Hard Drive, a few manufacturers and some older systems limit this power. If you find that your Toshiba Portable External Hard Drive does not spin up, you may require a USB "Y" cable. This cable combines the power from two USB ports to provide ample power to your drive. Please contact Toshiba Direct for information on purchasing a "Y" cable. PR: PRO Memory Upgrade not only offers factory original RAM for Apple, Dell, HP, IBM, Sony, Toshiba and Sun computers and servers made by DRAM manufacturers, they also allow RAM shoppers to make offers online if they see the same memory module upgrade type for less elsewhere. Selling truth about computer memory upgrades, keeps systems running properly. PRO Memory Upgrade is helping customers avoid pitfalls of upgrading computer memory with an online store that guarantees all memory modules purchased are an exact quality of those originally installed at the factory, unless they become end-or-life. With the RAM expansion market being rather tricky, PRO Memory Upgrade discloses the truth about the brands it carries and eliminates the guesswork in quality. There are no "house brands", OEM eTT, pulled or refurbished part types of RAM chips sold through their store. Weather you are upgrading your Apple MacBook Pro, Dell PowerEdge or Sun Fire, the consistently of memory upgrades remains the same; buy identical brands and part numbers that Apple, Dell, HP and Sun choose to install. The PRO Memory Upgrade store holds quotes for .gov & .edu customers for extended periods as they have reserves on server memory modules. PRO Memory Upgrade can very easily hold a quote on a 1000 piece 4 GB Fully Buffered or Registered module quote for up to 30 days, which is unique in a volatile memory market. Delivering unique set of attributes targeted toward small business, government and educational institutions, PRO Memory Upgrade enables procurement of higher quality memory upgrades at greater values. PR: QuickerTek, the specialist in power and wireless Apple products, has announced that when customers buy any one of its three most popular wireless networking products or the MacBook external battery, they get an upgrade to Mac OS X "Snow Leopard" free. QuickerTek has tested all of its products with the new Mac OS and is celebrating compatibility with this special offer. The featured products include the Dualy USB for $325.95, Dualy Extreme for $350, Quicky USB $225 high powered wireless networking antennas, and the popular external battery/chargers for MacBook, MacBook Pro, and MacBook Air at $349.95. Customers get superior wireless networking products as well as the latest Mac OS from Apple. Like most QuickerTek products, these four products are backed with a one-year warranty on parts and labor. QuickerTek has been a recognized leading innovator of antennas, RF and battery/power products for Apple computers. PR: Introducing Autograph. Simple signature capture for MacBook. Also, super fun. Autograph an email or document in less than 7 seconds. It works in Word, Pages, Mail, iChat, and many other applications. For a limited time, Autograph is free when purchased with Pogo Sketch. For use only with Signatures? - No Way! Use Autograph for silly doodles, poodles, polite gestures, or anything else you can think of. 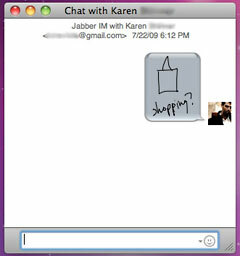 You can even use Autograph to sketch in iChat. Automatic Insert: Waste time scanning, trimming, pasting in a signature? No thanks! One keystroke inserts your signature or note into an open document. Easy HotKey Activation: Just like a pen, Autograph is at your fingertips. Customize the HotKey to anything you d like. Swipe to Undo: Flub your last name? No problem. Three-finger swipe left or right to undo/redo. Try that with a pen! Biometrics: Bio-what? You've probably never had a handwriting expert evaluate your penmanship. For us, that's a good thing. But just in case, Autograph includes all the details that make a signature uniquely yours. And that, gentle reader, is how you can tell the signature to the left is not in fact Mr. John Hancock of antiquity. Lots more fun features: Colors, Hover-mode, and many other features are just waiting for you to try them out. Give it a shot today! If you have a silver MacBook with black keys, that's a great start. You can already use Pogo Sketch. You must also have OS X 10.6 Snow Leopard installed (it was released on Aug. 28). Upgrading is a snap. Need to be sure? It's easy! Give the free version a quick try. You can download the free version, which contains a watermark, and use it for as long as you'd like. Simply drag it to your Applications folder to install. It's easy to register later, if you need to. Registering Autograph removes the watermark. Way. More. Fun. Note: For a limited time, Autograph is free when added to your cart with Pogo Sketch. MBP 15"/17" Owners: Important v1.2 fix available now via update!